Every winter I get a few folks asking if I’m heading back to Alaska for the Iditasport race on the Iditarod trail. That’s an easy “no”, especially after reading about this year’s race. It’s not that I didn’t enjoy the race, at least once it was over, it’s just that it’s an amazing tough, enduring race that really could be life threatening if ones luck ever ran out in the remote Alaskan bush. And I was very fortunate to have a good race on my last attempt when a professional video documentary was made. Popping the DVD in the player is an easy way to relive the misery — or just reading Mike Curiak’s blog. However, I still have hopes for running the Susitna 100, a shorter 100-mile race where the odds are much better for being rescued should things get ugly. Mike Curiak is the top dog in endurance racing. He doesn’t do the 24 hour loop-in-a-circle-until-you’re-a-veg. He does the endurance races that most think are simply impossible. 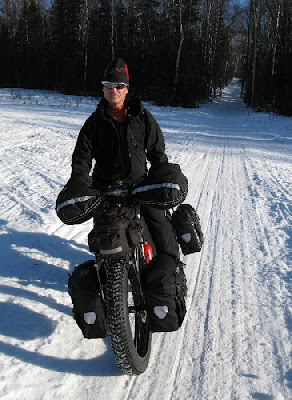 Right now he’s riding the entire Iditarod trail at the same time as the Iditarod Trail Invitational race. Mike’s ridden the full 1100 miles to Nome before. He’s already won that race. This time he’s doing it fully unsupported. Compared with most races and rides, the Iditarod is about as unsupported as you get. You can stop in cabins along the way and purchase a meal. Further along the trail you can stop in small villages and buy food. Mike’s won’t be doing that. He’s on his own and carrying everything he needs. Just surviving on what you have is amazing. I just can’t imagine the willpower to ride past some of those cabins where they’ll gladly serve some hot tomato soup and grilled cheese sandwiches. Spending a day slogging through snow, eating just Clif bars and trail mix certainly makes you appreciate a basic hot meal. The above photo is from Eric Parsons. Eric’s company, Epic Designs made Mike’s storage and handlebar mitts. His stuff looks absolutely bombproof and very well-designed. And I know Mike sets the bar pretty high for his gear. If the stuff didn’t work, it wouldn’t be on his bike.